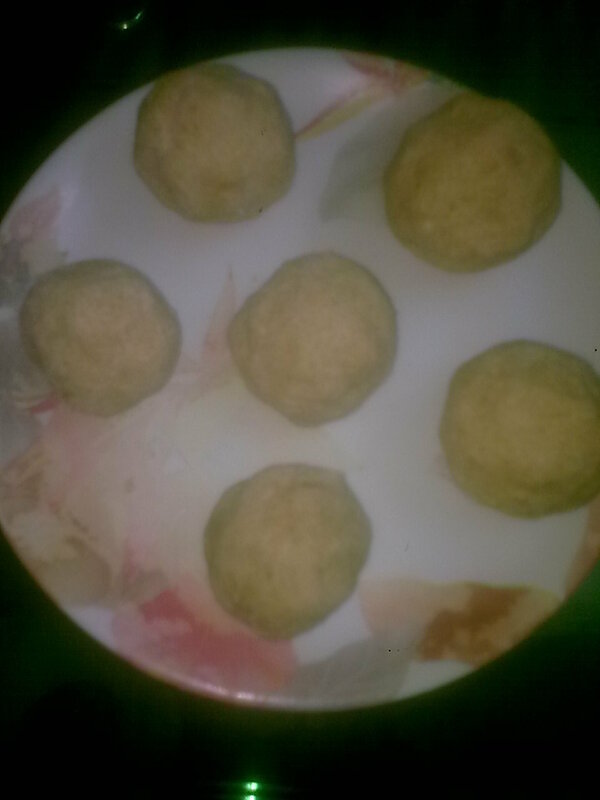 This is one of the sweets which is prepared during Diwali..known as pityache ladoo in konkani.It is simple delicious and can be had at anytime of the day :-) some people prefer these over besan ladoo (I shall be posting shortly) but I like both equally..
Take 4 cups of flour and add in the pan. Slowly roast the flour on a very low flame till the raw smell of flour goes.This may take around 15 minutes. Once done transfer the flour into a plate. Add in the powdered sugar(around 2 cups),cardamom powder. More sugar can be added if you have a sweet tooth. The flour will be hot.Let it cool a bit. Take flour in batches and start adding ghee little by little and make circular shaped ladoos.The amount of ghee to be added should be just enough to allow you to prepare the ladoos.The ladoos must be prepared when the flour is warm because if it cools it will be difficult to bind the flour and prepare them. This makes approx 12-13 ladoos.